I wanted to push this chart out to showcase one of the biggest mistakes I see businesses making in their mobile marketing plan. You see it everyday with your favorite brands. What is this I am talking about? The launch of the mobile app. Many times, you find your favorite brand launching a mobile app on the iPhone. They do this because they assume that the iPhone has the greatest market share and they will be able to hit most of the customers by doing this. The problem is, most companies have an app developed only for the iPhone. 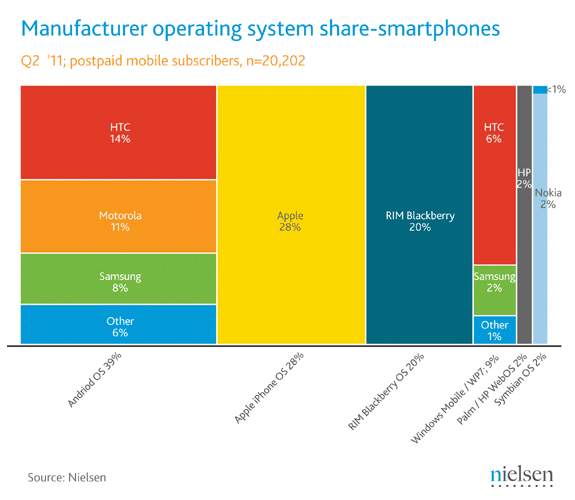 The chart above shows that even though the iPhone it self does hold the largest market share as a product, it does not hold the largest market share for mobile operating systems. Currently, Android holds that place at 39% and continues to grow. That 39% is mostly divided amongst 3 major manufactures as well as some smaller ones that are not listed. This would be why nobody ever realizes how much Android holds. 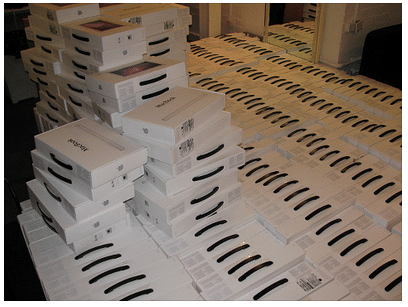 Even though it is divided, all of those devices are running a version of Android. Failure to recognize that there are other smartphones out there than the iPhone can seriously limit your marketing potential. I am not saying you need to have your app for ALL mobile operating systems, however, you should at least talk to your developer about what it would take to make it work with the two hottest devices at the start. With the latest in jQuery, building a mobile landing page or mobile site is much easier than building out a full blown app. Using modern programming, you can create a great looking page that looks and functions similar to an app. One system that works great is the free jQuery mobile. This gives you many abilities to make your page look like a true app. The best part about building out a mobile site that works like an app is that you make it once and it will work with most of the above smartphone operating systems. This means you make it once and your all set. The other great part is management will be easy. You make one change and its changed for all devices. If you have a mobile website or a QR code that leads to a mobile landing page, be sure to test it on all the major mobile devices. I worked on a project recently where we found that just because our site looked great on the iPhone, it had several bugs on the Android default browser, despite using mobile jQuery which states it works great in both Android and iOS. I would love to find out what phones everyone uses below. Please post a comment stating which phone you use and how you like it. Please, lets not turn this into a flame war though. Respect others as everyone has a reason they use the phone they use. Both my wife and I use Android on Sprint. I have the EVO while she has the Hero. I have nothing against the iPhone just cant afford the expensive plans that come along with them on AT&T and Verizon. If they came to Sprint, I would give it a hard look. Yeah, once my Evo dies, I will take a look around. The Evo does just what I need it to do so for now, there is no need to switch.